STRAPPING a saddle to a T-Rex, you hop on board, point his nose toward a distant mob of hostile reptiles and get ready for the fight. Later, when vanquished corpses lie all around, you call in your pterodactyl and soar into the sky for a taxi ride back to your home base. Ark makes all of these fantasies reality and confirms what we knew all along: everything is better with dinosaurs. 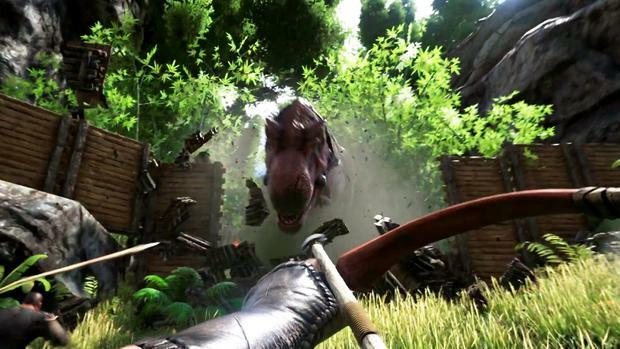 But Ark encompasses considerably more than a playground with dino figures, even though this “Early Access” preview version has a long way to evolve before the finished product is due in June, when it will also be available for PS4. It blends a slice of world-builder Minecraft, a wedge of survival horror DayZ and a chunk of giant-killing Monster Hunter. Into this melting pot of influences it throws a soupcon of sci-fi mystery for flavour. Waking up practically naked on a tropical island, staying alive amid the teeming menagerie of 50-plus prehistoric species of animals becomes your immediate priority. With no tutorials and precious little in-game help, you’ll blunder your way through the opening hours, dying regularly but retaining progress. Gradually, you’ll learn to level up, build a base, fashion armour and weapons and – best of all – tame dinosaurs. Like Minecraft, you can play alone and tweak many parameters to take the harshness and grind out of the world – such as limiting damage or speeding up dino-wrangling. But Ark’s at its best when you join public servers and cooperate as tribes for larger goals or simply protection from other players. The ruthlessness of others coupled with the unfriendly wildlife makes for a frustrating experience in the early days. But persistence gives you the wiles and the resources to eventually enjoy Ark for the breadth of its primeval sandbox. Things get really interesting once you graduate beyond primitive weapons such as axes and earn the blueprints to confusingly unprehistoric firearms such as rocket launchers. 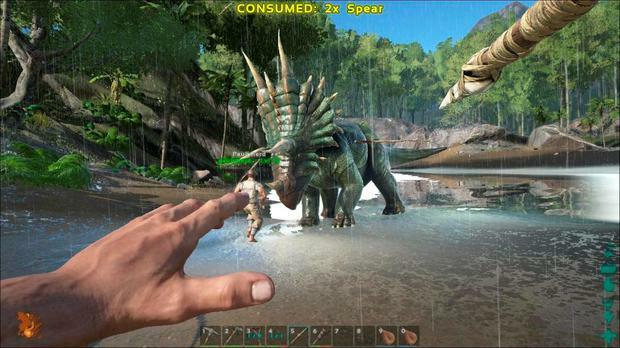 Ark isn’t built as a competitive shooter – at least not yet – but it’s another layer to its complex world. Technically, though, everything’s still decidedly ropey. 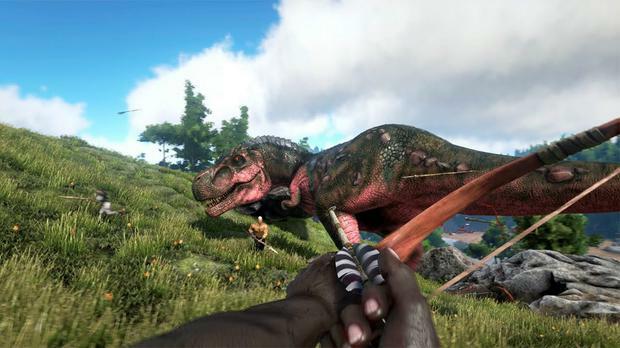 Frame rate plummets and stutters at key intervals and the amount of texture and object pop-in makes Ark resemble a last-gen product half the time. Additionally, its clumsy interface betrays its PC origins, where it is still also in Early Access mode but has nonetheless managed to sell more than one million copies. Yet with a few months of development left, the €35 cut-price admission ticket to its Jurassic world seems fair.